NEW Skat Blast HEPA VAC! Won't Clog and Recovers 40% More Dust than Bag-Type Vacuums! 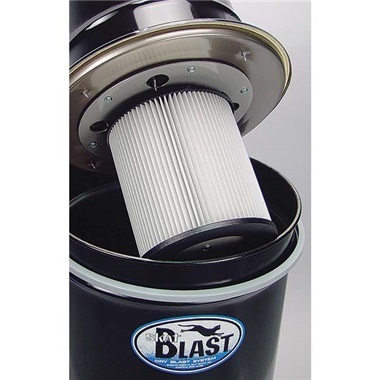 NON-STICK FILTER CARTRIDGE MEMBRANE - Resists clogging because dust and dirt simply fall off the filter surface before it can build up. This enables the Vac-50 to have 40% more suction and 56% more filtering area than older-style bag-type filter vacuums which clog over time. The Vac-50 works like NEW every time! 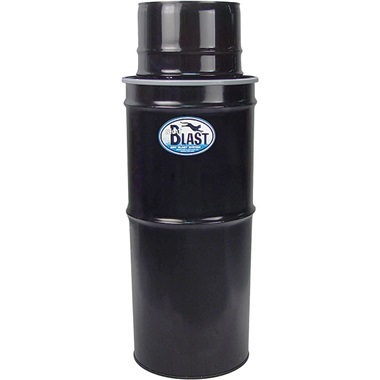 This is a great filter and I ould have given it 5 stars except that in my 8' x 4' x 3' blast cabinet it is a little slo in keeping all the dust out. Service & Delivery comments: It as delivered very quickly and arrived in good shape. It took a while to pull the trigger on this purchase. The cost was equal to the price of my blasting cabinet (a used one). But it is so quiet and so much better than that shop vac I was using that I don't even think about the money now. Service & Delivery comments: Hook up was a snap. Went with the VAC-50 after my VAC-40 motor died. Considered just replacing the motor, but AM SO HAPPY I WENT WITH THE UPGRADE!1. MUCH QUIETER.2. MORE AIRFLOW = less dust in cabinet3. Much lighter. NO BAG inside Can to deal with. Service & Delivery comments: VERY FAST AS ALWAYS! Pros: Easy to use., Really cuts down the dust. This kit does a great job cutting down the dust in my shop. I didn't have a great way to vent to the outside so this a very cool alternative. Service & Delivery comments: Delivery was very fast and items arrived in perfect condition. I would buy this again. Good quality piece. I bought this for the vacuum that's attached to my blast cabinet to help avoid dust in my shop from the vac exhaust. It's only been a few weeks now but it is working perfectly. It was a perfect fit and included all the hardware needed. Nice quality feel. I don't foresee any problems with this. Service & Delivery comments: Arrived in a very short time. Sooner than I really expected and that is ALWAYS a pleasant feeling. I've just started to use the system on my blast cabinet - so far so good. First off, we've been running our blaster hard since the day it was delivered. We have not had any problem with escaping media. The cabinet is tight and solid.However, we are not able to vent to the outside. This filter is more for a JIC scenario.Moving up to TP products is one of the best things we've done to improve our shop. Service & Delivery comments: Delivery of products is amazingly quick and follow-up CS is impeccable.